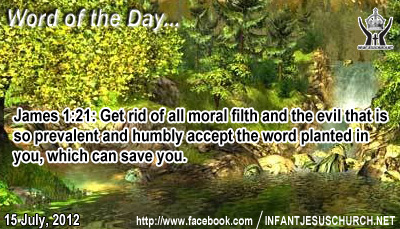 James 1:21: Get rid of all moral filth and the evil that is so prevalent and humbly accept the word planted in you, which can save you. Heavenly Father, with the help of your Holy Spirit, today we willingly and determinedly give up the immoral habits in our life. We recognize that these not only offend your holiness and grace, but also solidify us to your will, pull us away from your character, and blunt our witness to others. Please forgive us and sustain us as we seek to live a life wholly satisfying to you. In Infant Jesus' name we pray. Amen. When Jesus proclaimed the kingdom of God he met resistance and opposition. He tells his disciples that they have to expect the same action if they are to live and to announce the reign of God. There is both a caution and a privilege in his statement. Just as Jesus had to take his cross, so the disciples must carry their cross and not try to avoid it. To suffer for the faith is to share in the vocation of Christ. The Holy Spirit gives everyone power and grace to live as disciples of Jesus Christ. Do we trust in God’s grace to carry our cross for Jesus’ sake? A healthy fear of God guides to spiritual maturity, wisdom and right decision and it frees us from the oppression of sinful pride, weakness - especially in the face of evil and spiritual dishonesty. Do we trust in God's grace and mercy and submit to his word?